How Much "Innovation" Is REALLY Going On ? The introduction of something NEW, now there's a novel idea. When I read the WSJ article by Leslie Kwoh, "You Call That Innovation ? 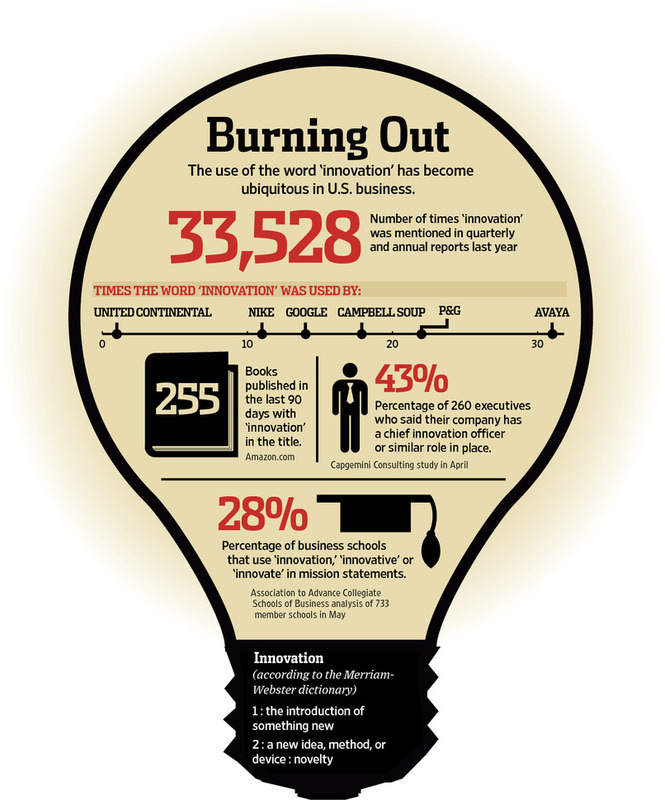 Companies Love to Say They Innovate, But the Term Has Begun to Lose Meaning"; it struck a cord. As she says, "innovation is in danger of becoming a cliche', if it isn't one already." Her article made me think because a successfull Linkedin Group I created and manage is titled, "Fitness and Wellness Innovation"; Now I'm considering a name change. Innovation, based in the Latin term innovatus, meaning renewal or change, has become divorced from its essence in many of today's popular organizational pursuits. Many leaders use the term to describe activities which are hardly innovative at all. I know of one CEO in particular who has used the term incessantly during talks over the past two years while their organization hardly innovated anything at all; it's embarrassing. Why ? The efforts of many in industries and organizations have more to do with self preservation than addressing a future that isn't kind to past abilities or thinking. I guess if people say the term innovation enough they might believe they're actually innovating. While any change could be technically termed innovation, the reality is that real innovation is much more - its disruptive and disruption is rarely born from parents of the status quo. Why is this important ? Industries are changing and very quickly, so if you're not on top of that change you are likely going to become extinct. Don't believe me ? Check this out. ...while the fitness and wellness industry has grown over the past quarter century, obesity and health quality in the developed world have not improved. Many argue they've gotten worse. The fitness industry still serves about 15% of the adult population while failing to broaden its appeal to the not yet fit. Something is broken because things have not improved and I fear the industry is failing to reach its promise and as a result, things need to change - but how ? Innovation; as Vijay Govindarajan, Professor at the Tucks School of Business at Dartmouth and co-author of 10 Rules for Strategic Innovators , is about 2 major things. First, leaders must accept things ARE changing and figure out how to adapt accordingly. Second, leaders must understand change is NOT a technical problem its a MINDSET problem. Therefore to enable a business or even an industry to adapt one must introduce NEW mindsets. "Most companies say they're innovative in the hope they can somehow con investors into thinking there is growth when there isn't." WOW, but SO true. If the fitness, health club and wellness industries and organizations participating within these industries want to innovate, they must do 2 things: admit things are REALLY changing and accept enduring the change requires changing their MINDSETS. That requires opening the door to new voices and new leadership. So the next time you hear someone use the term "Innovate" listen up and question if it is really innovation at all. Are you being "conned" as Christensen says, or are they part of a new order of things ? What do you think about the term innovation ? Please share your thoughts with me, Bryan O'Rourke and thanks for reading the post.